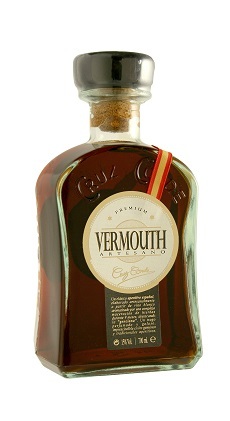 Vermouth 1902 Cruz Conde receives 90 points in Wine Enthusiast Magazine and is one of the 100 best spirits of year 2016. 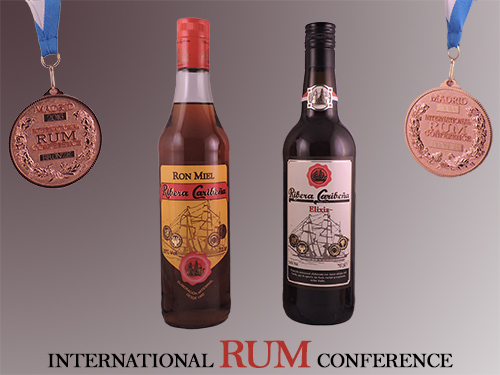 Bronce medals for Ribera Caribe�a Elixir Rum and Ribera Caribe�a Honey Rum at the V International Rum Conference which took place last week in Madrid. 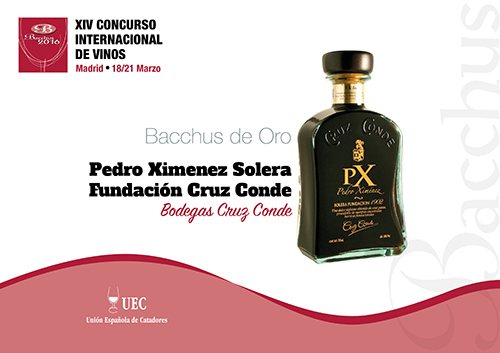 Our Pedro Ximenez Solera Fundaci�n awarded Gold Medal at 14th Bacchus International Challenge. With a punctuation of 90,6/100, the wine is number 32 on 1.854 wines tasted during the Competition coming from the 5 continents. 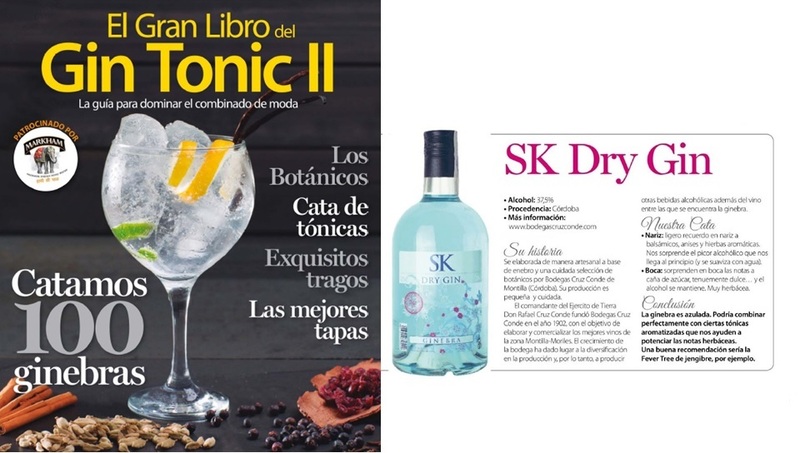 Second edition of magazine « The Great Book of Gin Tonic” is now available with the tasting of 100 Gins including our DRY GIN SK BLUE with tricks and recipes to prepare a Gin Tonic. 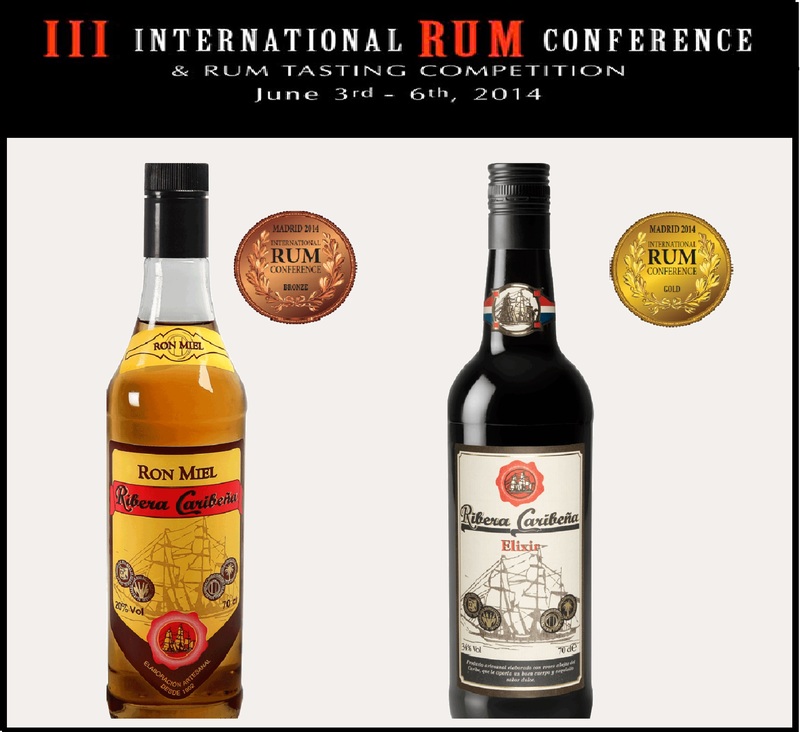 Pedro Xim�nez Solera Fundaci�n Cruz Conde wins Gold medal at 31st edition of International Wine Challenge (IWC). 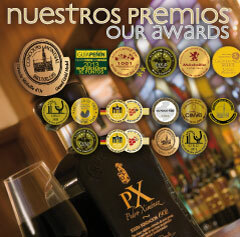 This year, Spain received 50 Gold medals, 189 Silver and 342 Bronze medals. 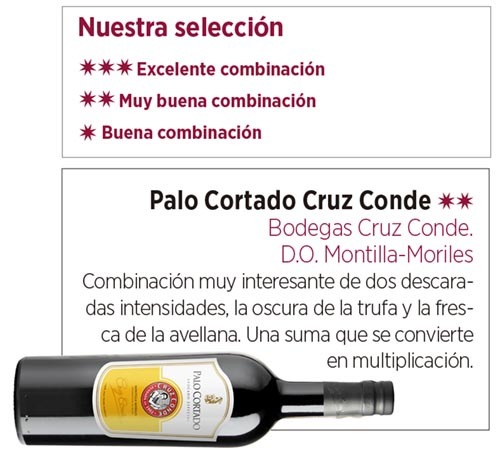 "GUIDE OF DAILY WINE 2013-2014"
Our Palo Cortado and Pedro Ximenez Cruz Conde with 9,1 and 8 points, respectively are situated into the Honor Roll of the "Guide of Daily Wine 2013-2014" from the magazine MiVino-Vinum. The Guide gathers a rigorous selection of more than one thousand two hundred Spanish wines with a price inferior to ten Euros valuing their quality in a scale from 0 to 10 points with tasting notes and pairings proposal. In number 245 of prestigious magazine Vino + Gastronom�a, you can find a wide and interesting article about Vermouth “The perfect aperitif since XVIII century”. To complete the article, the review included a tasting notebook and selected 11 vermouths from different countries between which our VERMOUTH ARTESANO CRUZ CONDE PREMIUM. 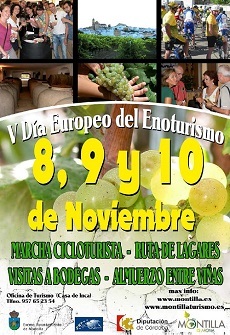 Since 2009, the European Day of Wine Tourism is celebrated and promoted by RECEVIN as the occasion for the main winemaking areas in Europe to commemorate that day at the same time by promoting and spreading their wine offer, gastronomy and patrimony. In the number 189 of October 2013, the magazine MiVino-Vinum suggests our Palo Cortado Cruz Conde to be tasted with excellent Fried Eggs with truffles from Abraham Garc�a, Chef-Owner of the Madrilenian restaurant Viridiana. 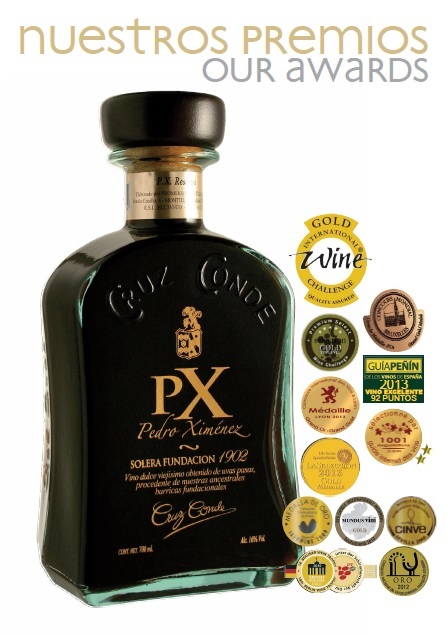 In 2013, our Pedro Xim�nez Solera Fundaci�n 1902 was awarded with the Great Gold Medal in the International Contest of Brusselles for the second time. In the current year, this wine has also been awarded with the Great Gold Medal in the International Contest of Lyon and Prowein, as well as being given 92 points in the Pe��n Guide. 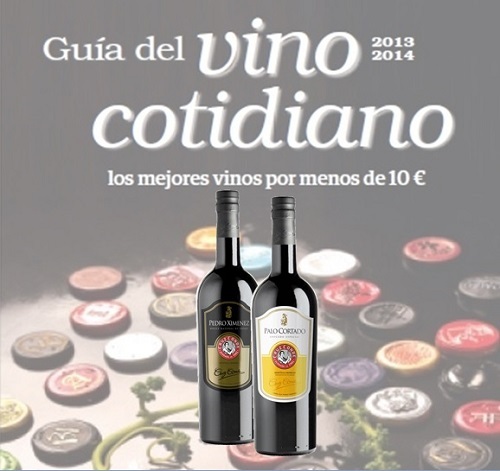 30th Edition of Montilla � Moriles Wine Degustation. As in previous years, wines D.O. 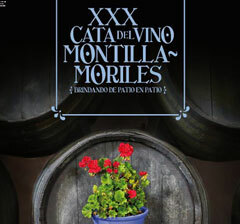 Montilla – Moriles and Cordoban gastronomy get together in the 30th Edition of Montilla – Moriles Wine Degustation. �All rights reserved. Bodegas Cruz Conde 2013 - Terms and Conditions.